Searching for a Never Compromise putter? have you been wondering what they feel like to use and how do they roll the ball? Our hands-on reviews will tell you! You can also find out where to buy them at the best prices! Never Compromise made a name for themselves in the 1990s and 2000s with easily-recognisable black and grey putters with ultra low weight polymers which they bonded to heavier materials to give their putters an extremely high proportion of heel-and-toe weighting. In their early models, the gray areas are the low weight polymer and the black areas the highly weighted material. 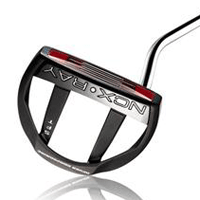 Never Compromise moved briefly into the niche world of high-spec milled putters with its Gambler range. Although these promised to be competitors to the Ping Redwood or Scotty Cameron Studio Select ranges, with high quality materials and finish, they did not sell well, despite being good quality products. We recommend these therefore as a good quality putter available at a very affordable price. Not sure if a Never Compromise putter is right for you? Click here for our guide to choosing the right putter for your stroke.